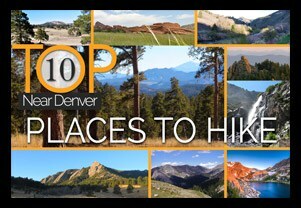 Where are the best places to hike near Denver? Over the years we’ve profiled over 140 hikes, and I’ll tell you that it’s hard to pick favorites–but we did. 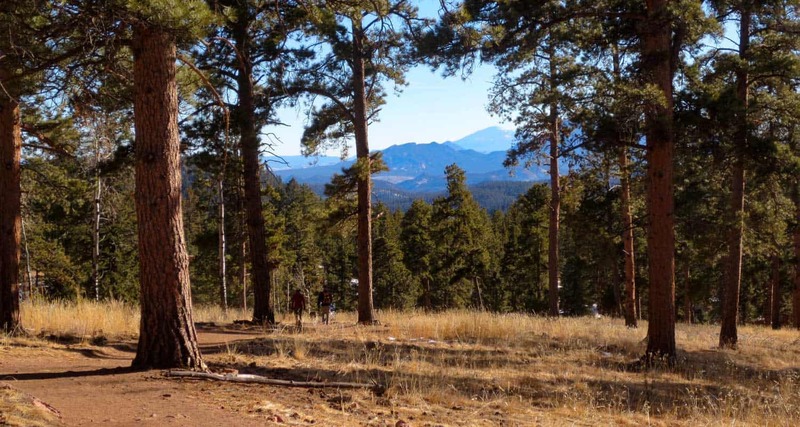 Below you’ll find ten of our favorite hikes near Denver. Actually, we cheated a bit. We’ve included some parks and trail networks, so some include two or more hikes. These are hikes near Denver that we often recommend to friends new to hiking or who are visiting Denver. Some are just a few miles out of town, and others require a drive deep into the mountains. The Wild Basin of Rocky Mountain National Park is situated south of Estes Park and just north of Indian Peaks Wilderness area. The Wild Basin offers some short waterfall hikes and longer more demanding hikes up to secluded mountain lakes. Copeland Falls can be found about 1/2 mile up the main trail, but most hikers journey beyond to Calyspso Cascades which makes for a 3.6 mile round trip journey. Hike further into the Wild Basin to find yet another waterfall crashing over a granite cliff face, Ouzel Falls. 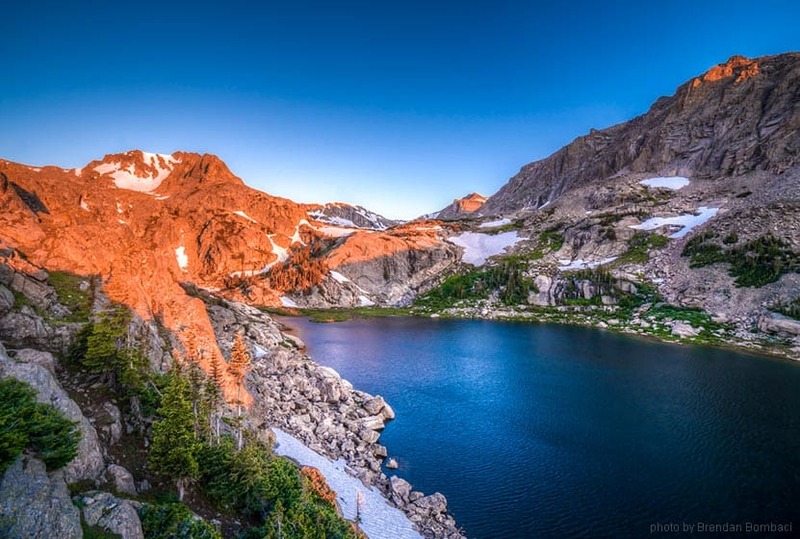 In the Wild Basin trail network, hikers will find sub-alpine lakes such as Bluebird Lake (12 miles round trip) and Pear Lake (9 miles round trip). Follow each of the links above to get trail maps, trailhead information, and more detailed trail descriptions. 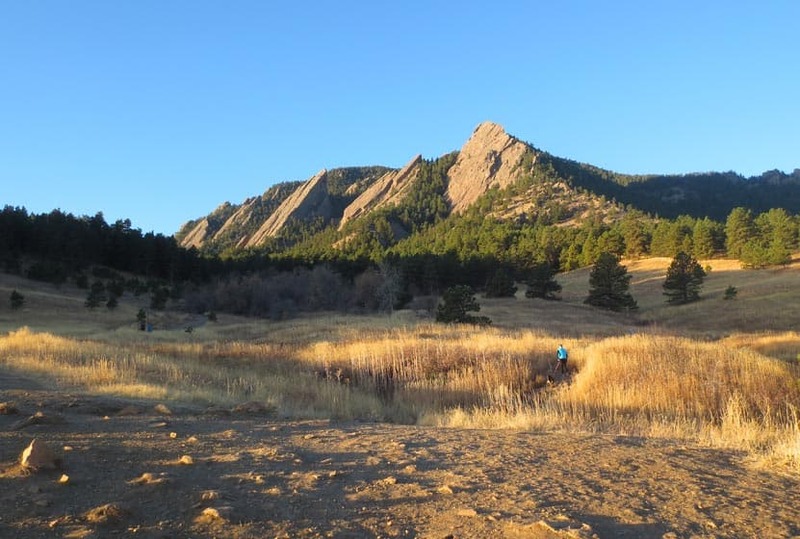 Chautauqua Park, in downtown Boulder, hosts dozens of trail options. It’s probably the best trail system within a city limits on Colorado’s Front Range. 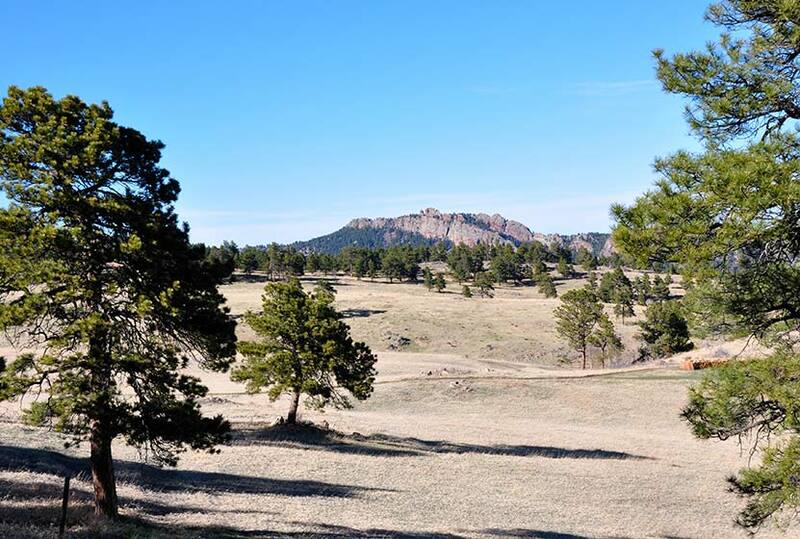 Hike one of the many trails to soak in the views of the Flatiron formations that make this park famous, then grab lunch or a coffee at one of Boulder’s downtown restaurants. One of my favorite hike destinations near Denver is the alcove hidden behind First and Second Flatiron. You can access the full trail profile here for photos and more details: First and Second Flatiron Trail. The Royal Arch Trail has been rehabilitated since the 2013 floods and takes hikers underneath a massive granite arch that towers over the trail. 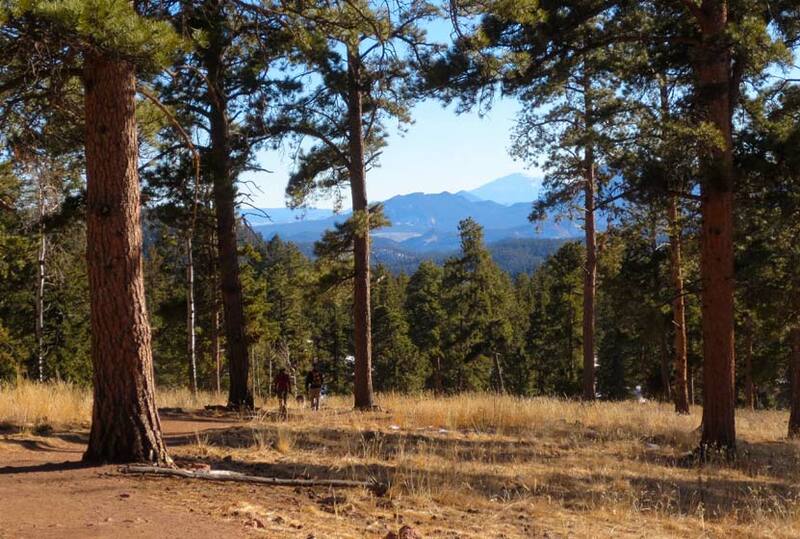 The Enchanted Mesa Loop is less demanding, taking hikers through pine forest and offering more expansive views. Finally, for a more demanding hike to 360 views of Boulder and snowcapped mountains in the west, the hike up to the top of Green Mountain proves to be both a strenuous workout and a great place to kick up your feet and take in the views. Staunton State Park is just 40 minutes outside of Denver. It’s Colorado’s newest State Park and boasts miles of trails, myriads of climbing routes, great mountain biking, and the highest waterfall near Denver. However, there are two worth noting if you are looking to hike in Staunton. 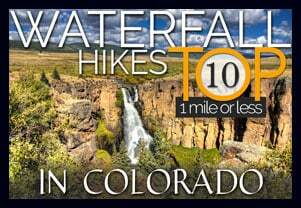 The hike out to the Elk Falls overlook is a demanding 10.8 mile loop. And a new 12-mile trail takes hikers closer to the base of the falls. 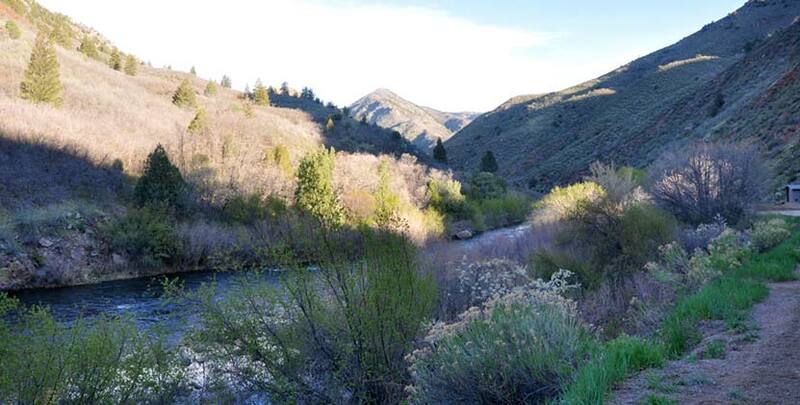 For a more accessible family hike, check out The Davis Ponds Loop. It’s a great place for kids to learn to fish and a perfect spot for a picnic. If you are looking to enjoy Rocky Mountain National Park and would like to avoid the busy east side, the western side of RMNP, near Grand Lake, offers miles upon miles of trails. There are miles upon miles of trails leading out of the Green Mountain, East Inlet and North Inlet trailheads. However, it’s a solid 2 hour drive if things are moving on I-70. Here we’ll recommend just three hikes: a short waterfall hike, a longer hike to a slide waterfall, and a lake loop hike. Adams Falls is one of the more accessible waterfalls in Rocky Mountain National Park. It’s just over 1/2 mile round trip. Beyond Adams Falls, the trail opens to a wide valley of tall grass and meandering stream. The hike to Granite Falls is a longer 10.2 mile round-trip hike to a slide waterfall. A third option is actually just outside on the borders of Rocky Mountain National Park at Monarch Lake. The Monarch Lake Loop Trail takes hikers through forest, across small creeks, and around the borders of Monarch Lake. The mountain upon mountain views make it worth the drive. 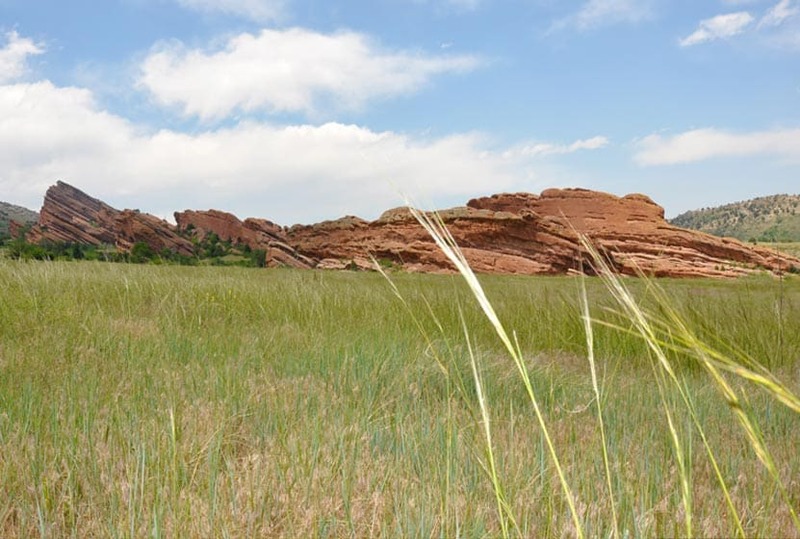 Red Rocks Park is home of the iconic Red Rocks Amphitheater and some great hiking trails. When visitors to Denver are looking for a trail close to the city, my top recommendation is always the Trading Post Trail at Red Rocks. It’s a 1.4 mile loop surrounded by red rock formations. In the Spring and early Summer, the clash of reds and greens makes this the best short hike near Denver. While the Trading Post Trail is a short and easy hike, the shaded sections can get icy in the winter, so be sure to mind the trail. Explore the full trail profile with more details and resources at our Trading Post Trail at Red Rocks trail profile. A second hike option is the Red Rocks trail. It’s is a 6 mile lollipop loop that leads hikers north towards Matthew Winters Park to views of the Dakota Hogback. Explore the full trail profile for the Red Rocks Trail here: Red Rocks Loop Trail. There are many other hikes near Denver that feature red rock formations. To explore more, be sure to check out our Hikes with Red Rock Formations page. 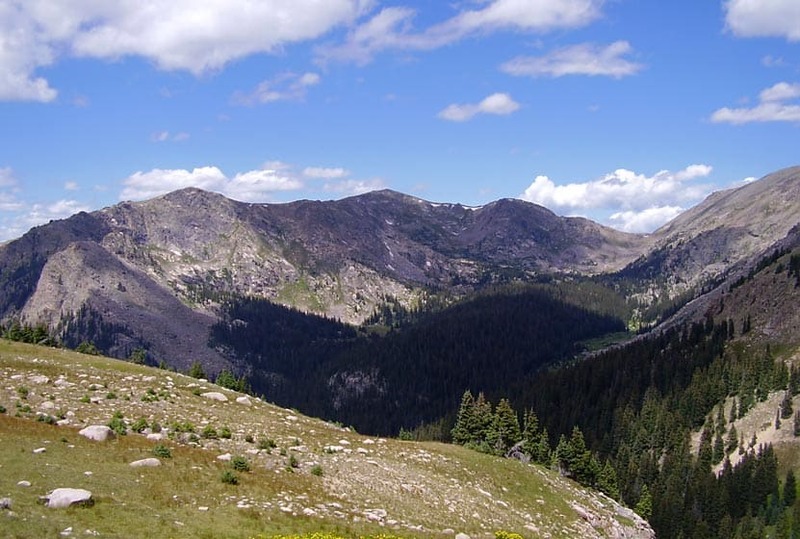 The Eastern side of Rocky Mountain National Park is popular for good reason. We’ve selected just three hikes to feature in this list, but you’ll find many more on our Rocky Mountain National Park Trails page. If you’re into waterfalls, you’ll want to explore our Top 10 Waterfalls in Rocky Mountain National Park page, too. The first hike in this set is a loop hike that takes hikers past four high mountain lakes and a waterfall. It’s a 6.4 mile trip that begins at the Bear Lake trailhead. For driving directions, waypoints, and a full trail description, see our Four Lakes and Waterfall Loop trail profile. The second trail begins at the Fern Lake Trailhead and leads up to an incredible cascade waterfall, Fern Falls. This is a 5.4 mile, out-and-back adventure with about 650 feet of elevation gain. Before arriving at Fern Falls, the trail passes through Arch Rocks and crosses a bridge that spans a landmark known as The Pool. Hikers who are up for a more demanding trek can make their way further up the trail to Fern Lake. For map, driving directions, parking info, and trail tips, visit our full trail profile for Fern Falls. 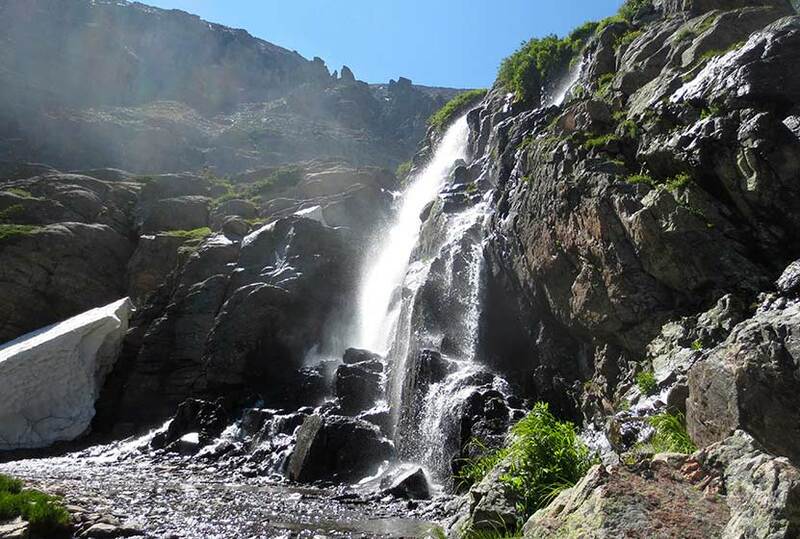 The third hike in our list for the East side of Rocky Mountain National Park is the hike up to Timberline Falls. It’s a demanding 8 mile round-trip, out-and-back hike with about 1500 feet of elevation gain. This beautiful segmented waterfall cuts through the winter snowpack in late Spring cascading down the mountainside. The trail goes beyond Timberline Falls and higher up to Lake of Glass and Sky Pond–both are breathtaking locations. Read through the full trail profile for Timberline Falls here. It should be noted that dogs are prohibited in Rocky Mountain National Park. Hikers will find the National Geographic Rocky Mountain National Park Topographic Map a necessary resource for the trails in RMNP. Distance: 1 mile to 12.4 round trip. 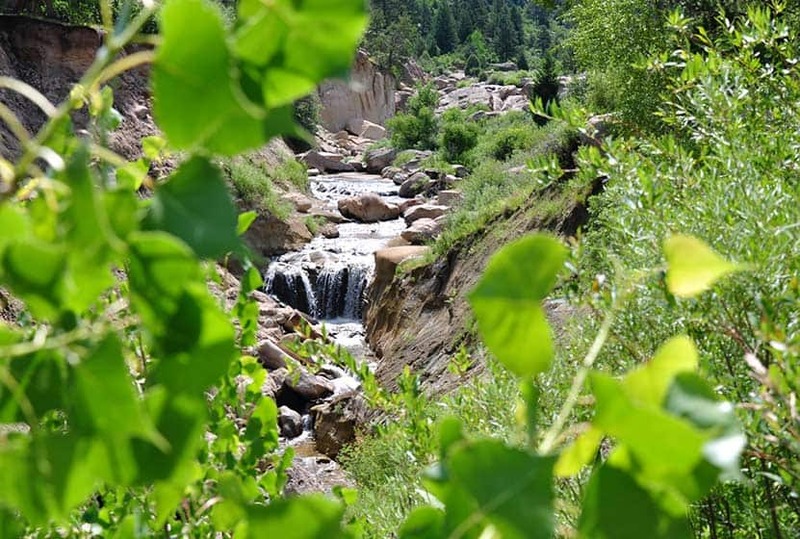 Waterton Canyon is a classic Denver Hike that follows a winding dirt road 6.2 miles up to the Strontia Springs Dam. There are picnic spots all along the way and a lot of wildlife to be seen. Unlike many of the trailheads in the Denver area, Waterton has ample parking. Because Denver Water uses this trail as an access road to its reservoirs, the trail is actually a wide, dirt road, making it perfect for handling both hikers and mountain bikers. However, I’ve found it to be a quiet spot for a late afternoon picnic, especially on a weekday. No dogs are allowed in Waterton Canyon in order to protect the Bighorn Sheep population. 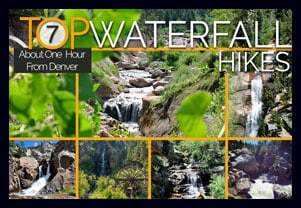 Get the details on this hike at our Waterton Canyon Trail profile page. Castlewood Canyon State Park is tucked away in the rolling grasslands just east of Castle Rock, Colorado. Cherry Creek flows through the center of the canyon creating a small waterfall that can be found on the West side of the park. Explore the ruins of an old dam on the East side, and the ruins of a turn of the century homestead on the West side. Rock climbing is also popular in the park. 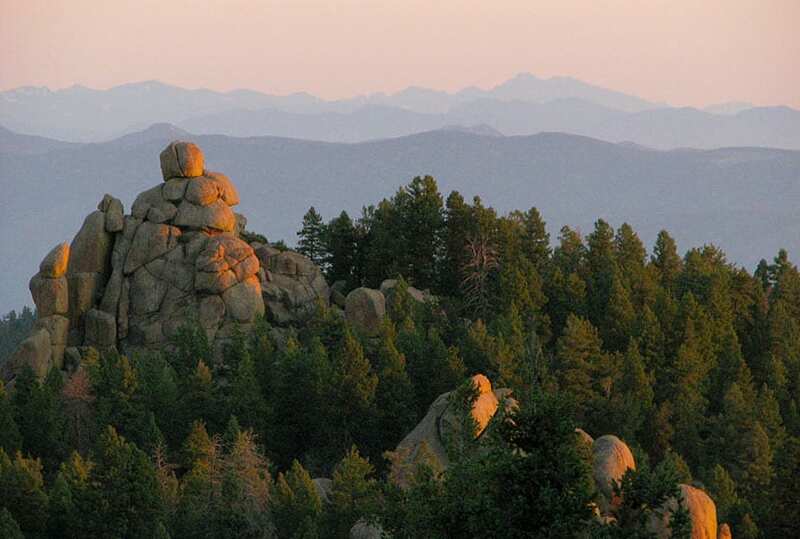 See our Castlewood Canyon State Park hikes page for driving directions, tips, and more details on these hikes South of Denver in Douglas county. The 1.4 mile hike and several hundred stairs that lead up to the Devil’s Head Lookout Tower is worth every step. From the lower elevation aspen glade, to the views of Rampart Range on the way up this trail is one that constantly delivers Wow-moments. The granite rock formations that make up the spine of the Rampart Range that surround Devils Head are worth the early morning trek to see them illuminated by the sunrise. Just before the lookout tower, the trail emerges from stone corridor of rock to an idyllic glade complete with a USFS cabin surrounded by towering granite outcroppings. However, the best part is the views from the top. Hikers can see for 100 miles out to the eastern plains, south to Pikes Peak, west to the Tarryalls, and north to Longs Peak. Explore the Devils Head trail profile for more details, photos, and a video of the views from the top. Our final hike near Denver is a 2 mile loop hike just 45 minutes outside the city near the town of Golden, Colorado. Because this hike is situated in the eastern climbs of the foothills, it provides incredible views of the city of Denver–especially at dusk and dawn. In the full trail profile, we show how to assemble several short trails to form this loop hike. To get the details on this hike near Denver, Colorado, explore our detailed trail profile for this Sunset Loop in White Ranch with trail map, hiking trail tips, and video of the trail.